The attack of termite is considered to be one of the worst. As they are capable to cause maximum damages to property, one is always supposed to take the corrective measures on time to make the area safe from their attack. It is definitely something important for the property owner to have adequate knowledge about termites and should also know the ways how they can prevent them from attacking the territory. If a person is aware how he can prevent the termite attack, he is definitely going to avoid costly damages. If you consider that termites are not going to harm your property then it is your huge mistake. You yourself won’t know about the damages, until it comes to an end. In this blog, I am going to share the best knowledge about termite prevention and also the ways that can save your property against unwanted losses. 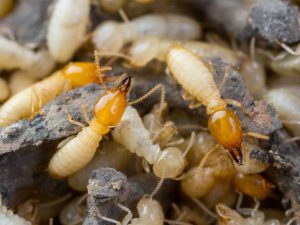 What is Best Pre-Construction Termite Control Tip? However this is not applicable in all the cases but still a better way to keep the termites away forever. This is starts during the planning stage of construction and continues throughout the construction. In this procedure a Basaltic Termite Barrier (BTB) is made of rock particles packed so tightly beneath a house that termites are unable to get through it. Many termite control companies also go for termite mesh which is a stainless steel screen with small holes, termites cannot pass through, and perfect for problem areas such as cold joints in concrete. Now this is the most common concern because most of the people take corrective measures once they find that termites have already invaded their property. The first thing you are supposed to do in this is that, you should start cutting soil connection with wood. In case there are leakage in faucets then try to fill it up as early as possible. You should maintain at least 4 inches of gap between your home and mulch. Apart from these ways below you are going to know something even more interesting about the same. Termites do the damages so smartly that you will get to know about the things when it is at the last stage. As they start damaging a property from the inner point, until and unless it comes out, you will not know about the same. This is the main reason why they are capable of doing the maximum damages to property. They would leave behind their evidences of existences like carton” and ‟frass,” which are the waste materials left behind by subterranean and drywood termites, respectively. Along with this, the damage pattern caused in the wood by the termites would let you know about their type. However, if you don’t possess knowledge about termite breeds and types, it would be better for you to contact a termite control company for investigation of the same. Here are few of the most effective ways that will keep the termites at a bay from your property. Follow the tips if you really don’t want these little monsters to affect your property in any case. All the shrubs around your home should be trimmed. There should be a gap of at least 12 inches between the shrubbery and exterior wall of the home. It is helpful because this will let the nice air to flow inside your home and there would be no chances of moisture inside and moisture leads to termite breeding and growth. Along with this, it will also allow the termite tubes and termite damages to get noticed easily. Instead of using mulch, you should use pine needles. I am suggesting it because they are less appetizing to subterranean termites and will also help minimize the environment that other insects such as ants like to nest in as well. You can also use pea gravel or other non-organic material in case pine needles are not available to make a barrier between mulch and the exteriors of your home. You should put all sprinklers heads pointed away from the foundation of your home. It is necessary because this may create moisture and moisture attracts subterranean termites. Prevention is always better than cure. If you want that your property should not be attacked by the termites then you should keep on monitoring the home against the attack of termites. The exteriors and windows of home should be maintained properly, as this is the only way you can fight with them. If there is a crawl space underneath your home then make sure it has proper ventilation and a good vapor barrier to help minimize moisture from reaching the floor joists and subfloor. You should always remember a thing that moisture is the most destroying element. It not only creates soothing environment for the termites but it also invites fungus to wooden property. Along with this the stingy smell created by moisture can also irritate you and could become carrier of diseases like allergies and infections. I am sure that this blog has helped you in finding the possible ways to eliminate the termites from your property. If you have a regularly maintained property then the chances of attack are less. Along with this, regular inspection of a termite control company will also help you out. If you are looking for the best solution then pre-construction pest control provides you with the same. In case you want to get rid of termites in your existing home then get a regular inspection done at your property by an experienced termite control company. If you are looking for a termite control company in Gurgaon then Gurgaon Termite Control could be a place where you will get the effective solution against the attack of termites. Along with this, the lowest charges of termite control will help you to do the things as per your budget.